Love’s memories, love recalling itself in letters lost and found over an interval of forty years: Cixous’s writer-narrator advances here far into a labyrinth of passions long ago delivered and yet still arriving through the mail, through letters and literature, in other words, the poetry of the post. As for the lovers’ returning scenes, they have their addresses in Paris (rue Olivier de Serres, Avenue de Choisy, street names that endlessly feed love’s unconscious language) and in New York, but also in a lost oasis of the Egyptian desert during the Napoleonic wars, in Athens and along the shores of a great lake centuries ago in the country of myth. The lovers are poets or soldiers, philosophers or students madly in love with poetry and poets. They are as well mermaids or panthers. Panthers? Yes, for it is the passion of the animal that drives all these lovers to bare themselves, and sometimes their claws, before the beloved. Misunderstandings are often, even inevitably the result. Seconded and witnessed by her passionate, truth-telling cats, Cixous’s narrator-writer returns unerringly to moments of errancy inflicted on address and language, those errors and faults when love, perhaps, is listening only to itself, without subject or object, lover or beloved, just love itself, l’amour même, l’amour m’aime, love loving me, in the letter box of memory. 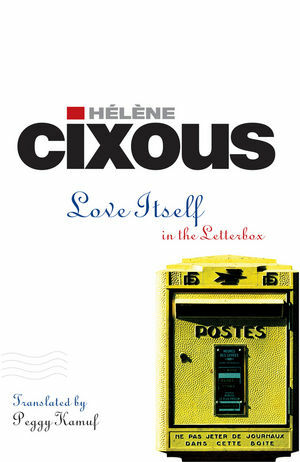 Hélène Cixous is one of the world's leading writers. She is the founder and former director of the Centre de Recherche en Études Fémininesat the Université de Paris VIII. "A rarefied examination of love, passion and the intermittences of the heart, beautifully translated by Peggy Kamuf." "Hélène Cixous is today the greatest writer in what I shall call, if I may, my language, French. And I weigh my words in saying this. For a very great writer must be a poet-thinker, very much a poet and a very thinking poet." "A profoundly intense, individual and brilliant piece of work." A major new book by one of the leading feminist writers in France today. Cixous explores the themes of love, memory, language and loss. This is a work of literary fiction and at the same time a philosophical work: like Sartre, Camus and other great writers, Cixous blends together fiction and philosophy. Cixous created a distinctive form of feminist writing called ‘ecriture feminine’ and she is its leading exponent. This new book is a major contribution to this genre. Cixous is very well known in the English-speaking world and her work is widely read, especially in the US.